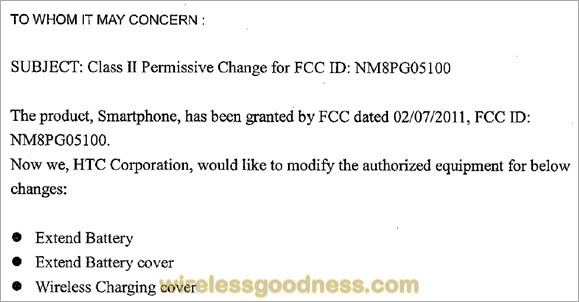 The FCC received a visit from the back cover of the HTC ThunderBolt. You might think that the whole phone had already received FCC approval and you would be right-except for the fact that HTC is planning on revising the handset's cover to allow for wireless charging. As we reported, LG has introduced a wireless charging pad that is expected to be available for its current smartphone lineup, and of course the Pre has been able to charge without wires since its launch in 2009. Texas Instruments recently introduced a power receiver chip 80% smaller than the previous chip. The smaller size should make it easier for manufacturers to design wireless charging into their cell phone designs. So far there is no word on pricing or a launch date for the HTC ThunderBolt's wireless charging package. Its just another one of those inovative technologies that never took off. this will make it bulkier. it's already a brick to carry. ppl losing chargers a lot and this is not helping to sell a sh...load of wired chargers. apple also famous for giving you free accessories right? Hahaha.... btw, my htc tbolt had no headset in it for $249. every phone I ever had included one. got one from evilbay for 6 bucks. cheapo company, crappy battery life, i won't buy another htc. What phones have you gotten that came with a headset? The only one I think I've ever had that came with earbuds was a blackberry 3 years ago. You got a pair for 6 bucks so why are you complaining anyway? It has a 3.5 mm headphone jack aka universal. This is hands down the greatest phophone I have ever owned and I've had my fair share of phones. Blackberries and iPhones come with headsets. I'd hardly call the thunderbolt the greatest phone ever. as jcoberg said below, I'd much rather have a 32gb micro SD card than cheap, crappy sounding, uncomfortable earbuds any day of the week. Also, I said it's the best phone I've ever had and its an opinion, not a fact. I didn't call it the greatest phone ever. pick a different soap box to stand on because your $6 grip doesn't mean anything. they included a 32GB memory card ($100) and did it cheaper than their nearest competitor Apple iphone 32GB. It is called priorities. what sounds better FREE 3.5mm Ear Buds!!!!! or FREE 32GB MicroSD Memory card!!!! I would rather have the ear buds, my iPhone happens to have a hard drive built in. I just don't see the need for the Micro-SD card. doesnt every phone have a hard drive built in? and what will u do if you need a bigger hard drive? have the geniuses install one for you? might as well just pop a larger SD card in. ear buds... LOL are they still those crappy white ones that hurt my ears? so lets make a big clunky phone EVEN bulkier.. NO THANKS. i will stick to having a cord. The TB is not that big relative to it's screen size, the Droid Charge is bigger. But the TB is heavy for a phone. Does extend battery mean that the battery will be a higher capacity? I must say I love my Thunderbolt. The battery is not great but I just keep it on the charger when I am in the car or at my desk. It would be great if I didn't have to plug it in every time just set it down. i totally agree. and i love my TB. im gonna root mine soon and use set CPU to control the cpu for the time its in sleep mode. a buddy of mine did that and now his TB lasts all day with heavy use and still has around 30% when he goes to bed. i completely suggest doing that if you are able to. I do not trust myself so i am going to bring it to him.